Basically, just come along in loose fitting clothes – preferably a Black 'T' shirt and track bottoms or long length shorts. After a few weeks , you'll probably find it useful to buy a kimono (Gi). As these are hard wearing & durable, many people find these more comfortable to wear for physical training. The hardest step to starting training is making the initial commitment – once done, it gets considerably easier. Why not come along & give it a go? We look forward to seeing you. As Ju-Jitsu is a contact activity, the Club Coach(es) will do everything possible to minimize the risk of injury but it is a requirement for all members to obtain Insurance cover through the club as a precautionary measure. In addition, every club member receives a personal licence to record their individual progress, belt grades and/or competition achievements. There is a nominal fee for membership of the club and larger Kaizen Ju-Jitsu Association. This entitles members to use all of the facilities and support services throughout the entire group. In the world of the martial arts, there are several paths to success. Rather than trying to take each person and mold them into the mirror image of some "ancient master", we teach the fundamentals that every functional martial artist must know and then let the individual develop their own style based upon their body's attributes and their personal tastes. Anyone exhibiting particular natural talents like flexibility, balance or speed is then identified and their special talents are incorporated into training to improve and complement their basic skills. This includes skills in striking, throwing, and grappling, which forms an excellent foundation in self-defense skills & fitness, as well as sport, if they should choose to compete. We are very fortunate to have links with many of the World's Leading Coaches & Competitors who nearly always now include Northern Ireland in their European tour arrangements. 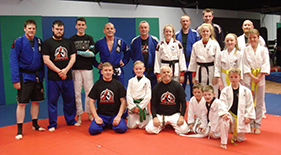 Using these international influences and a large local talent pool of black belts , anyone training at the club will be exposed to the most progressive training methods available. There are different belt colours in Ju-Jitsu, each is used to signify a particular level of knowledge & skill. All club members are taught using a set syllabus structure in order to ensure that the vital skills required at each stage are covered. Regular gradings are held. This allows for an opportunity to advance to the next stage of development. These gradings are performance based – they are not simply certificates of attendance. Each & every club member must be able to demonstrate to an independent examiner that they can perform ALL of the techniques competently in order to be successful. Any weaknesses will be identified throughout the course of the grading and these can then be worked on. It would be reckless to allow any student to progress until they have sufficient skills to cope within their new belt group. Experience shows that the most effective way to ensure success at gradings is simply to train regularly. Training reinforces learning and develops the student's skills in a gradual, progressive manner.